With no access to the spirit world, Baxley bluffs her way through the crime scene where a movie star s assistant and a charter boat captain were strung up and bled dry. In a haunted house, no less. Figuring out who killed these people will be a real challenge without her ability to speak to the dead. Book 3 of The Dreamwalker Series. I frequently read paranormal cozies, but this was my first encounter with a ghost dog! Baxley’s abilities as a dreamwalker were unique, and when they stopped working for her, it added a whole new layer of conflict to the story. The mystery kept me guessing, the characters were entertaining, and the paranormal element was a lot of fun. Doggone It is book #3 in the Dreamwalker series, but the first one that I read. I had no trouble figuring out what was going on, or who was who, but I wish I would have read the other books just to have seen the characters relationships develop firsthand. Formerly a contract scientist for the U.S. Army and a freelance reporter, mystery and suspense author Maggie Toussaint has thirteen published books. Her recent mystery releases include Gone and Done It , Bubba Done It , Death, Island Style , and Dime If I Know . 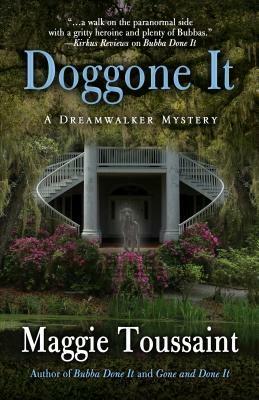 Her latest mystery, Doggone It , is Book Three in her dreamwalker series about a psychic sleuth. Maggie won the Silver Falchion Award for Best Cozy/Traditional Mystery. Additionally, she won a National Readers’ Choice Award and an EPIC Award for Best Romantic Suspense. She was twice nominated for the Georgia Author of the Year Award and finaled in the Beacon and the Readers’ Crown Contest. Maggie lives in coastal Georgia, where secrets, heritage, and ancient oaks cast long shadows. Visit her at www.maggietoussaint.com. NOTE: I voluntarily reviewed an advanced copy. I haven’t read this series yet and the dreamwalker and ghost dog intrigue me. Can’t wait to read ” Doggone It”. It was really good – I hope you’ll like it! Love your blog. Thanks for sharing your review.